A union dispute should not lead to filming of The Hobbit being driven out of New Zealand, the country's prime minister has said. 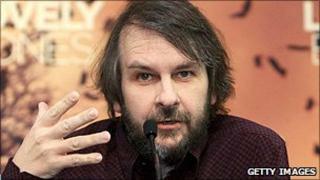 John Key said he would be "greatly concerned" if production on Peter Jackson's film was lost. Mr Key added the government was taking the unusual step of holding initial discussions with those involved in a move to break the deadlock on pay. Unions have urged a boycott until the contracts wrangle is resolved. Mr Key told New Zealand's TV One that The Hobbit should not be the target for the unions' demands for binding contracts for performers in the country's movie industry. The conservative premier said they were "holding to ransom one particular producer and one particular film". He added that the film industry is a lucrative earner for the country and a tool for marketing it as a tourist destination. In an open letter written last week, Lord of the Rings director Jackson accused Australia's acting union of using the dispute to move in on New Zealand's film industry. The Oscar winner said any shift of production base would lead to a "long, dry big-budget movie drought in this country". Jackson's Lord of the Rings trilogy won 17 Oscars and earned billions of dollars at box offices worldwide.